Inria - Toucheo: Multitouch and Stereo Combined in a Seamless Workspace. Abstract : We propose a new system that efficiently combines direct multitouch interaction with co-located 3D stereoscopic visualization. In our approach, users benefit from well-known 2D metaphors and widgets displayed on a monoscopic touchscreen, while visualizing occlusion-free 3D objects floating above the surface at an optically correct distance. 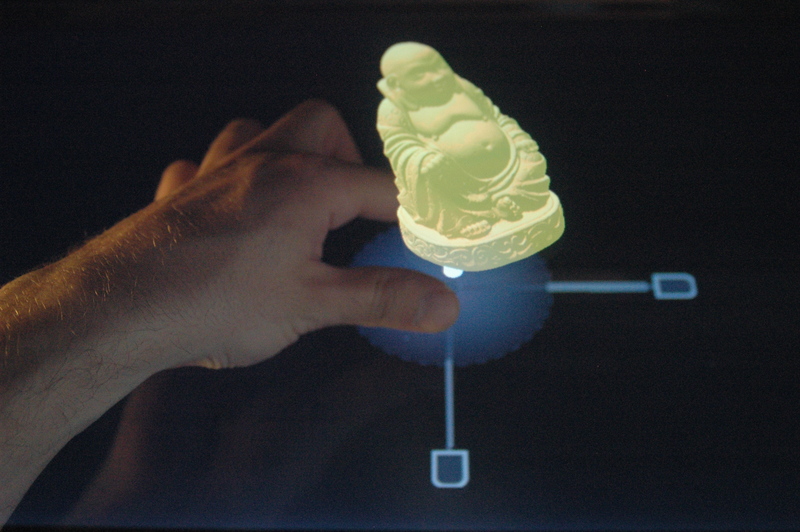 Technically, a horizontal semi-transparent mirror is used to reflect 3D images produced by a stereoscopic screen, while the user's hand as well as a multitouch screen located below this mirror remain visible. By registering the 3D virtual space and the physical space, we produce a rich and unified workspace where users benefit simultaneously from the advantages of both direct and indirect interaction, and from 2D and 3D visualizations. A pilot usability study shows that this combination of technology provides a good user experience.